My daughter is a third generation Girl Scout. Just like Annabelle, my mother and I made the Girl Scout pledge, promising to serve God and country, helping others at all times. While, as Girl Scouts, we share similar memories of earning badges and making friends, the reality is that the organization has come a long way since its creation a hundred years ago. Founder Juliette Gordon Low started with 18 girls in Savannah, Georgia. Today, Girl Scouts of the USA has over 3.2 million members. What began as a movement to develop self-reliance and resourcefulness in young women has led to the largest organization for girls in the world. Scratching your head right now? Lots of parents might think that with so many enrichment opportunities for girls today, being a Girl Scout isn’t really worth it. After all, isn’t it just crafts and cookies? Although my daughter proudly displays the purse she made from an old pair of jeans and looks forward to cookie booth sales season, it’s the Girl Scout commitment to service that keeps me coming back for more. But that’s the great thing about Girl Scouts. There’s something in it for everyone. In celebration of its centennial, 136 badges have been added to the Girl Scout repertoire. Girls on all levels have the option of participating in longstanding activities, like cooking, athletics, and first aid, as Well as exciting new opportunities, like digital filmmaking, and website design. As Girl Scouts CEO Anna Maria Chavez explained, the organization is “proud of its history but is also keeping up with what kids want.” Part of that effort involves making sure the new badges are kid-friendly. What makes the Girl Scouts so unique? “Girl Scouts help girls understand the global sisterhood, rich with cultures and traditions,” says Chavez. With troops and groups in more than 92 countries, it’s easy to see why the organization is known for inspiring, challenging, and empowering girls everywhere. And thanks to the Internet, Chavez explains, “the girls are developing new pathways,” enabling children in our Nation’s capital to connect with girls in Africa. Chavez says, “It’s important to show girls a positive future,” which is why annual events, like World Thinking Day, have become an integral part of the organization’s mission. 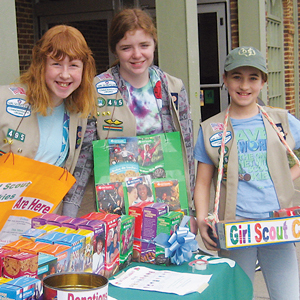 The Girl Scouts’ cooperative setting also offers children the opportunity to practice creative problem solving skills they might not be getting elsewhere. Since today’s young women have more career opportunities than ever, Girl Scouts teamed up with a popular business strategy consultant, Jump Associates, to determine the best ways to help these future leaders Develop their ability to innovate. Therefore, while the redesign of badges was the largest since 1987, it still represents what kids and parents want: fun with a purpose.Leveraging the children’s creative instincts, Girl Scouts hopes to train hybrid thinkers, build empathy, and enable great storytellers. Although I began my Girl Scout career as a Brownie, in the eighties a new Daisy level was introduced for five-year-olds or kindergarteners. Named after the organization’s founder, as Juliette Gordon Low was affectionately known as Daisy, this meant the Girl Scout family had expanded to include five levels total: Brownie, Daisy, Juniors, Cadettes, and Seniors, sometimes Known as Ambassadors. While financial literacy skills, such as earning money and money management, gained through fundraising remain a cornerstone of cookie season, Chavez assured me that philanthropy continues to be an integral part of the Girl Scouts mission. While the range of enrichment for Girl Scouts is expansive, one thing that hasn’t changed is the desire to move girls not only into their communities to serve, but also into their natural world. One of my fondest memories was winning the Yukon Sled Pull with my troop one snowy Saturday in New Jersey. With today’s kids spending less and less time outdoors, the Girl Scouts’ commitment to hiking, camping, and environmental stewardship Gives parents another reason to encourage participation. In an effort to assist girls in developing their full potential, Bronze, Silver, and Gold Awards are given to Seniors who have chosen an issue and taken action.Although not as well-known as the distinguished Eagle Scout award for boys, It is just as prestigious. Says Chavez, “Only one percent of the girls get it because of its difficulty, and military rank can be influenced by attaining it.” So if a young woman has her sights set on a career in the armed forces, her background in Girl Scouts is a great start. Adrianne, a mom friend who lives in New Kent, earned the Girl Scouts highest form of recognition when she was a Teen. “The planning and leadership that went into earning the Gold Award are not something that I could have gotten anywhere else,” she says. It’s obvious why her daughter is enrolled in Girl Scouts. While I packed up my badges in middle school, my daughter Annabelle talks about participating in their cultural exchanges, a program for older Girl Scouts that involves international adventures. However long she decides to participate, I know her time as a member of this outstanding organization will serve her well, providing her with a strong foundation in how to utilize her abilities to make the world a better place. Whether it’s through field trips or community service projects, being a Girl Scout means a chance to build courage, confidence, and character. It’s a legacy one hundred years in the making that still manages to encourage every girl to blaze a trail of her own. Previous articleWouldn’t You Like to Know…About Coach Mooney? Next articleSpring Greetings, RFM Readers!